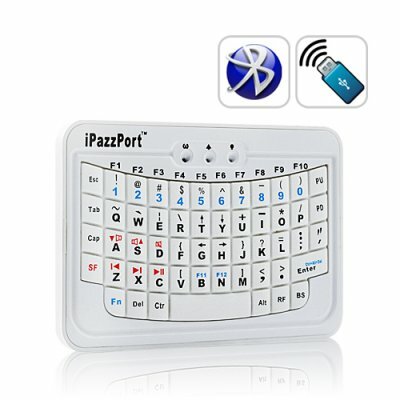 Successfully Added Super Mini Bluetooth Keyboard for iPhone, iPad, Smartphones to your Shopping Cart. Introducing the smallest and most convenient super mini Bluetooth keyboard yet! This wireless iPad/smartphone accessory is great for writing emails, sending texts, gaming, and overall just makes your handheld experience better than ever! You've seen small, but you've never seen this small! This super mini bluetooth keyboard easily fits into your pocket or bag, so you can whip it out and use it whenever you need to. Wirelessly connect to your smartphone or iPad through Bluetooth for the most convenient way to input text, as this Bluetooth device is the perfect solution to the error-prone touchscreen input of smartphones! Aside from handy text input, what else makes this portable super mini bluetooth keyboard special? Full QWERTY keyboard with fn key for maximum functionality! Easy wireless bluetooth connection with no cables or need for software! Built-in rechargeable battery that'll last for days! Beautiful red color backlit keyboard for use in the dark! Low, wholesale price! Brought to you factory direct so you save money! Don't delay! This product is stocked in our warehouse so if you order it today, Chinavasion will express ship it out to you tomorrow! If you plan to resell this item on a non-English website, the most common category names for this product are; Computer-Zubehör Großhandel, Accessori per computer all'ingrosso, Veleprodaja Rac(unalna oprema, Venta al por mayor Accesorios Ordenador, Vente en gros Accessoires informatiques, Distribuidor de acessórios de computador, Hurtowych akcesoria komputerowe, Groothandel in Computer Toebehoren, Barongan Komputer Aksesoris. How do I use this USB Mini Keyboard? Just pair it with any Bluetooth enable device! It's as simple as that! Some older Android handsets will work. However, because of the large number of Android devices available on the market, we cannot provide support or guarantee that this product will work with your particular phone.